(16/P73) TRENTON – Nearly four years after Superstorm Sandy, the Blue Acres Buyout Program has reached milestones of more than 500 property buyouts completed, including a closing on its first property in Downe Township, Cumberland County, and more than 800 buyout offers made, Department of Environmental Protection Commissioner Bob Martin announced today. Blue Acres buyouts have been under way in a number of flood-prone communities across New Jersey for more than three years, as recovery from Superstorm Sandy remains a steadfast commitment of the Christie Administration. The $300 million buyout program recently closed on its 500th property acquisition in Downe Township. Downe Township’s property closing is just the first of 11 properties in the Delaware Bayshore community that are lined up for closing. An additional 12 homeowners have already indicated a desire to sell their properties to Blue Acres. Natalie Fisch, a school bus driver, and her husband, Don Fisch, who owns a drywall business, had lived at a high point on Bayview Road in Downe Township for approximately 15 years before deciding to pursue a buyout. The couple found that lower portions of their road experienced flooding during high tides and full moons, as well as during bad weather, and they grew increasingly concerned about the viability of the local water and sewer line infrastructure after Sandy hit. Since accepting their buyout, the couple has purchased a home on Osborn Island in Tuckerton, Ocean County. The ability to keep their boat in their backyard to go fishing and crabbing, and knowing that utility lines are underground, are important to her and her husband, Mrs. Fisch said. Since its launch in May 2013 as part of Superstorm Sandy recovery, the Blue Acres Buyout Program has secured funding to purchases properties in 14 municipalities, with buyouts under way in eight counties. Closings have been completed on 503 properties, of which 371 have been demolished. So far, offers have been made to 806 homeowners and accepted by 618. “Immediately following the devastation of Superstorm Sandy, Woodbridge Township went to work to assist homeowners in the hardest hit properties in our flood zone,” said Woodbridge Mayor John E. McCormac. “Today, more than 175 Woodbridge Township home and property owners in the flood zone have applied to the Blue Acres program for property buyout relief, with 130 properties having been purchased at pre-Sandy value. The Federal Emergency Management Agency’s (FEMA) Hazard Mitigation Grant Program (HGMP); the U.S. Department of Housing and Urban Development’s (HUD) Community Development Block Grant – Disaster Recovery (CDBG-DR) program; the Blue Acres fund and the State Land Acquisition (Urban) fund provide funding for buyouts. The DEP will continue to submit buyout applications to the federal government for additional properties on a rolling basis. Recently, FEMA recognized the Blue Acres Buyout program as a Best Practice, citing the program’s Benefit Cost Analysis (BCA) approach to significantly reduce the number of properties requiring extensive and time-consuming reviews. Additionally, the program has negotiated more than $3.6 million in mortgage forgiveness on properties where the amount owned exceeds the home’s value – an achievement recognized by HUD in 2015. Governor Christie designated the Blue Acres Buyout Program in 2013 to run the state’s post-Sandy initiative to purchase homes from willing sellers in flood-prone areas, at pre-Sandy values. A special team expedites the buyout process, and includes individual case managers that work closely with homeowners to personally guide them through the process. 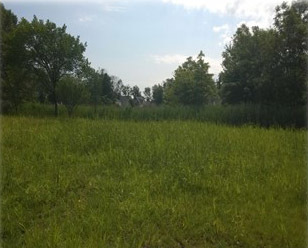 After a Blue Acres purchase is completed, the homes are demolished and the land is permanently preserved as open space for recreation or conservation purposes. A number of Sandy-damaged communities were among the first to take advantage of the Blue Acres Buyout Program, including Sayreville Borough, South River Borough and Woodbridge Township in Middlesex County. Purchases also have been made in other flood-prone areas of the state including: Manville Borough in Somerset County; Linden in Union County; Lawrence Township and Downe Township in Cumberland County; East Brunswick Township and Old Bridge Township in Middlesex County; Pompton Lakes Borough in Passaic County; and Newark City in Essex County. The program has also moved into New Milford in Bergen County and Ocean Township in Monmouth County. Homeowners interested in selling their homes or who have questions about the buyout program may call the DEP’s Blue Acres Buyout Program at (609) 984-0500.